SIMS FAMILY: Some fun new pics! Jeremy, Chad, and Korbin went flying with Jer's friend Steve while he was up here! They had alot of fun! This park is right down the road from up and it is so fun to take the kids there! They have such a blast! Me and Korbin at Ari's wedding! Korbin and his cousin Treydon! He is just flexing! :) SO adorable! Korbin is talking alot more and is so active! We love him so much! He is such a blessing in our lives and he is excited for a little brother or sister! I will be finding out what we are having in the next week or two! My due date is Nov. 27th! Very stoked! you guys look happy in that wedding picture. cute cute cute!! ha i love the flexing one! 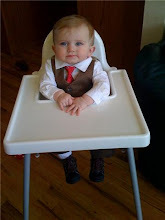 and the ones of him in his little suit are awesome! he looks like such a freaking little stud! hope you're feeling good love you! cant wait to find out what you're having! wahoo! For Jeremy on Fathers Day!! !